camera (Getty Images ) Rick Perry speaks at an event, Oct. 27, 2014 in Plano, Texas. Bobby Jindal speaks at the presidential debates in Boulder, Colo.,Oct. 28, 2015. Scott Walker speaks at the presidential debates, Sept. 16, 2015, in Simi Valley, Calif. 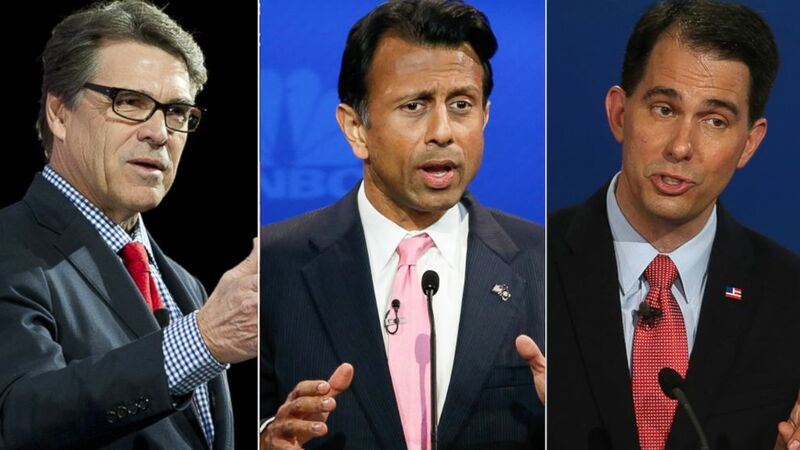 It is still almost three months before the first votes of the 2016 presidential primaries will be cast, but already the campaigns of three Republicans and two Democrats have come to a close. This week, Louisiana Gov. Bobby Jindal was the latest to call it quits. “I’ve come to the realization this is not my time,” Jindal said in an interview with Fox News on Tuesday announcing an end to his nearly five-month-long White House bid. Last month, long-shot Democratic contenders Lincoln Chafee, a former governor of Rhode Island, and Jim Webb, a former U.S. senator from Virginia, both cut short their presidential campaigns within a few days of each other. And in September two Republicans -- Wisconsin Gov. Scott Walker and, before him, former Texas Gov. Rick Perry -- pulled the plug. “I believe that I'm being called to lead by helping to clear the field in this race so that a positive conservative message can rise to the top of the field,” Walker said at a news conference on Sept. 21. So what went wrong for these would-be White House occupants? For one thing, four of the five drop-outs have one thing in common: They are all either former or current governors. Perry and Chafee both once ran states and Walker and Jindal still do. 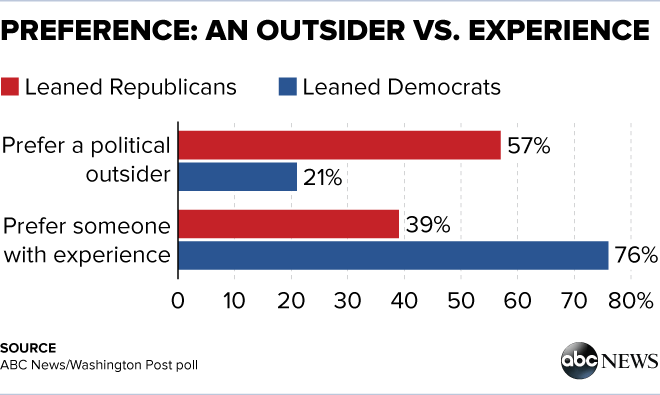 But 2016 appears to be shaping up as the year of the political outsider: In an ABC News-Washington Post poll last month Republicans and Republican-leaning independents by 57-39 percent say they’re looking for a political outsider rather than someone with political experience. Cash flow played a major role in the demise of their campaigns too. About a month before he quit the race, Perry, was struggling to make ends meet. Jeff Miller, Perry’s campaign manager, told ABC News that the presidential hopeful was so strapped for cash that he had to stop paying all campaign staff in early primary states as well as at his headquarters in Austin. Shortly after those reports, Perry announced he would suspend his campaign on Sept. 11. Just ten days later, Walker joined Perry on the dropout list. The Wisconsin governor’s dramatic fall came just two months after polls showed him leading in the polls in the early caucus state of Iowa. Walker started the race strong, raising $7.4 million dollars. But he quickly burned through 87 percent of his cash reserves on staff salaries, doling out a million dollars over a course of three months. Meanwhile, his candidacy was failing to gain steam. In a national poll released by CNN/ORC on Sept. 19 -- just two days before Walker would announce the end of his bid -- he registered at 0.5 percent. And in Iowa, his numbers slipped from 19 percent to 5 percent in just six weeks. From the start of his candidacy in June, Jindal struggled in both the money race and the horserace. As of Sept. 30 Jindal had raised only $500,000 and was spending it at a rapid clip. In addition, he never polled high enough to earn a spot on the main stage for any of the four GOP debates. In the most recent national ABC News-Washington Post poll the Louisiana governor barely registered. Perry seems to be taking a breather from politics. In October, he road tripped from California to Texas in a 1972 Chevy Chevelle SS. Gov. Scott Walker went back to his day job in Wisconsin, but was still taking donations. “As things changed dramatically in the presidential race, “Walker for America” incurred a campaign debt and it is my hope that you and all of our supporters will chip in and make an online contribution of $10, $35, $50, $100, $250 or more so we can end this campaign in the black,” Walker wrote in an email to his supporters. As for Bobby Jindal, he plans to work for his think tank, America Next, at the end of his term in January. ABC News' Veronica Stracqualursi contributed to this report.